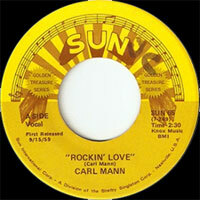 Chanteur Rock 'n' Roll US né le 22 Août 1942 à Huntingdon (Tennessee), Carl Mann a fait ses débuts en 1958 chez Jaxon Records, un petit label de Memphis (Tennessee). Il passe ensuite chez Phillips International où il obtiendra le succès. 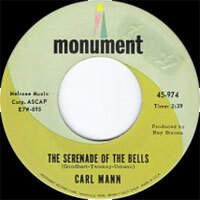 Après 1962, Carl se fera oublier rapidement, enregistrant pour Monument, ABC et Dot Records. Brillant performer, Vocalsiste et instrumentiste de talent, Carl Mann est à l'heure actuelle, l'une des figures les plus attachantes des rescapés des années cinquante. 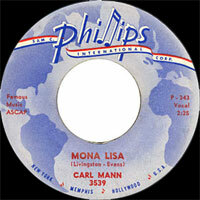 One of the last discoveries on Sam Phillips' legendary Sun label, piano player Carl Mann was best known for his rockabilly reworking of the Nat "King" Cole pop standard "Mona Lisa." That million-selling hit positioned him as something of a softer, smoother Jerry Lee Lewis, possessed of a crooner's instincts and a velvety vibrato. Unfortunately, Mann was never able to land another hit on the level of "Mona Lisa," despite waxing a fair amount of high-quality rock & roll. Like many early rock vets, he eventually moved into country music when the rockabilly market dried up, but never successfully established himself in that arena, and gradually drifted out of music. Carl Mann was born in Huntingdon, TN, on August 22, 1942. He grew up in a strongly rural area, where his family ran a lumber business, and fell in love with country music as a child. He began singing in church at age nine and soon moved on to performing country songs at area talent contests. He learned guitar at age ten, and piano at 13, by which time he'd already become a regular on local radio. He also formed a band with several other young musicians, and soon took an interest in the R&B and rockabilly records that some of his DJ friends played on the radio, especially those of Elvis Presley. 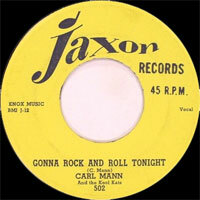 In 1957, Mann successfully auditioned for the Jaxon label and cut his debut single, "Gonna Rock and Roll Tonight" b/w "Rockin' Love"; those sides marked his first collaborations with guitarist Eddie Bush, who would become an important member of Mann's band, and assisted him on his rearrangement of "Mona Lisa." Mann cut several more unreleased sides for Jaxon over the next year, and caught a break when Carl Perkins' drummer Bill "Fluke" Holland offered to become his manager. Holland brought Mann to Sun Records in 1959, and Sam Phillips signed him to a three-year deal. 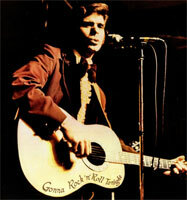 Mann cut his take on "Mona Lisa" early that year, and while Phillips wasn't keen on releasing it as a single, Conway Twitty heard the demo tape and quickly cut his own version, which began climbing the charts. Phillips hurriedly issued Mann's, which battled Twitty's all the way up the pop charts. Both hit the Top 30, and while they tended to cancel each other out in terms of placement, Mann's wound up selling over a million copies; and he wasn't even 17 years old. 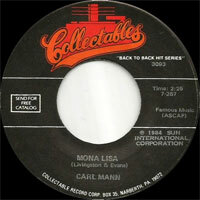 Despite the newfound stardom and several TV appearances, "Mona Lisa" turned out to be the pinnacle of Mann's commercial success. At first, he tried to repeat the formula by rocking up other vintage pop standards, which failed to return him to the Top 40, and perhaps even obscured the virtues of original tunes like "I'm Coming Home." Mann also wasn't helped by the fact that he'd appeared at the tail end of rockabilly's prime, or that Charlie Rich had taken his place as Sun's rising new star. Mann's first album, Like Mann, was released in 1960, but sold disappointingly, and he began to develop a drinking problem that necessitated some time away from music. In 1964, he was drafted into the Army; upon returning to the U.S., he signed with the Monument label, but the single "Down to My Last 'I Forgive You'" failed to return him to prominence. Mann soon left music to return to his family's business, settling down with a wife and finally overcoming his problems with alcohol. 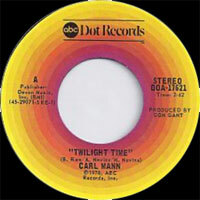 In 1974, Mann attempted a comeback singing straight country material; he issued several singles over the next few years on ABC and Dot, but they didn't fit in with the slick countrypolitan records then dominating the charts. In 1977, Mann got an offer from the Dutch label Rockhouse to record for European audiences; he issued a couple of albums on that label, 1978's half-live/half-studio Gonna Rock'n'Roll Tonight and 1981's In Rockabilly Country. Mann toured periodically during the '80s, returning to Europe every so often, and finally retired to concentrate on the family logging business. He still resides in Huntingdon, TN.